“If you know your past, you can change your future,” says Brenda Wong Aoki. In 1909, Gunjiro Aoki, a dashing young Kendo master from Japan, sparked demonstrations and a California law adding Japanese to the races forbidden to marry Caucasians when he and the white daughter of the archdeacon of Grace Cathedral fell in love. As punishment for introducing the pair, the young man’s brother—the archdeacon’s protégé—was ban­ished to Utah. The protégé and his wife died there, leaving behind 11 children whose history vanished into the dirt of the land they share­cropped. Years later, Brenda Wong Aoki, one of the exiled protégé’s granddaughters—a flowing-haired dancer and 1976 graduate of Mer­rill College (community studies)— resurrected the story in a one-woman play that she took to cities around the world. Three times a National Endowment for the Arts fellow, Aoki has plenty of stories about where she came from, along with ghostly tales of old Japan, which she recounts through dance, music, and spoken word in her award-winning mono­dramas. 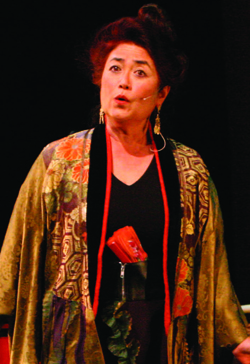 Combining the ancient arts of Noh and Kyogen theater and commedia dell’arte, Aoki brings her stories to life, including tales of her child­hood as a Long Beach “ghetto girl” of Japanese, Chinese, Scot, and Spanish descent. In her working-class neighborhood, she shared close quarters with five siblings. With a laugh, she says the biggest appeal of college was shar­ing a room with only one person. For Aoki, college was a mixture of discovery, guilt, and self-doubt. She dropped out once to do community work, but returned, brimming with the idea that people also needed food for their souls. One night, she says, after per­forming that play in a small high school in Appalachia, two young women came up to say her story had been theirs too. It didn’t mat­ter that they grew up in a different time or place. Just as she did that night.